An ancient island twinkling in the heart of the Mediterranean, Malta is a honeymoon destination that brings romantic vistas and antiquated backdrops. With intimate Mediterranean dining, abundant activities and luxurious accommodation too, honeymoons in Malta offer a little bit of everything. Found in the heart of the Mediterranean Sea, Malta is famous for a succession of powers who have called the island ‘home’ throughout history. From the Greeks, Romans and Normans to the French and the British, this assortment of ancient international influences has left its mark on the island. Malta, as a result, feels like nowhere else in the world. This internationalism and history makes its way into every aspect of life in Malta today – from high-end cuisine marrying unexpected and mouth-watering flavours, to postcard-perfect historical sites to visit with the backdrop of the Mediterranean Sea never far away. Basking in over 300 days of sunshine per year too, Malta is one of the sunniest nations in Europe, making island honeymoons here full of colour and memories. 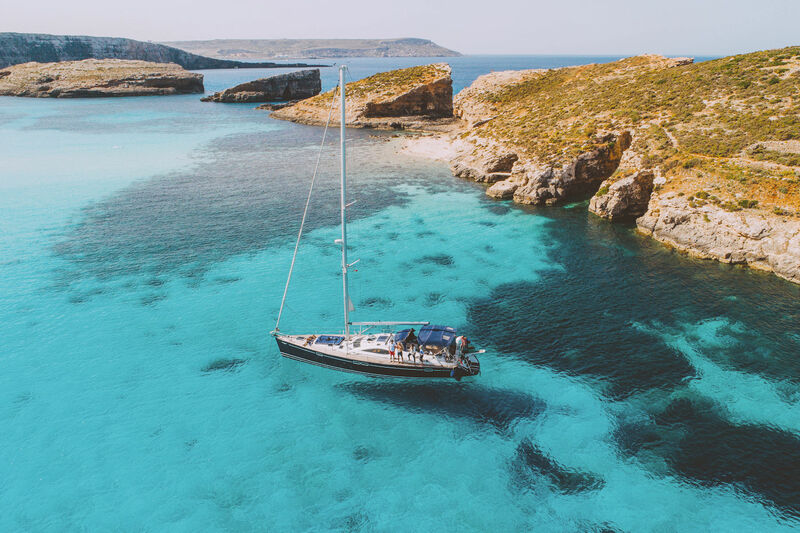 At just 17 miles long by 9 miles wide, Malta is a manageable island to explore – ideal for those who like to feel they’ve gotten to the heart and soul of a destination while on holiday. For newlyweds or those renewing their vows, honeymoons in Malta offer memorable experiences, gorgeous surroundings and all of life’s little luxuries. One of the best things about Malta is that there’s an array of activities for couples with a range of interests. Getting active, exploring towns and villages and getting stuck into the local history and culture are all possibilities on the island. Impressively, Malta is home to three UNESCO World Heritage Sites: the City of Valletta, the Megalithic Temples and the Ħal Saflieni Hypogeum. 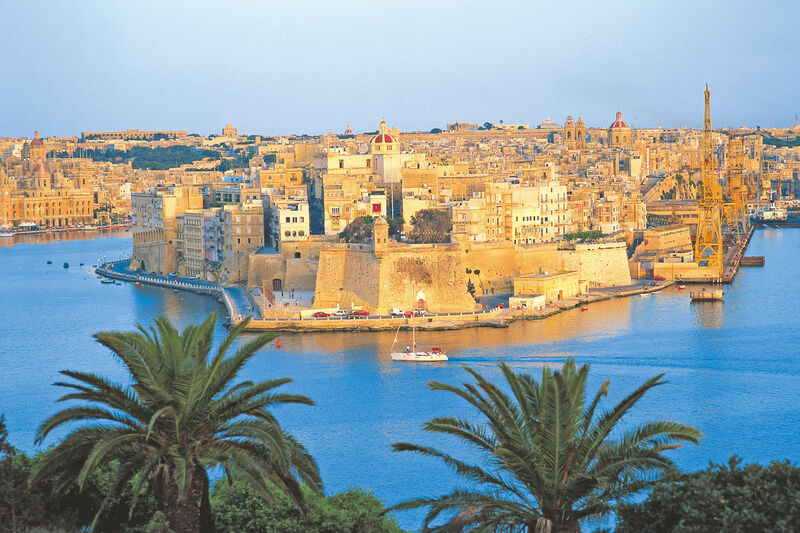 Valletta is Malta’s capital city, built by the Knights of St John from the 16th century onwards. 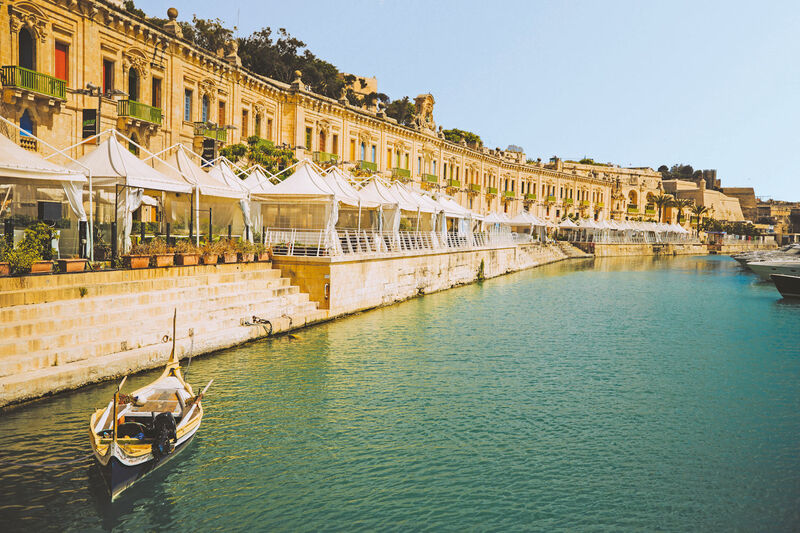 A walled city with still-standing fortifications, Baroque palaces and beguiling churches, Valletta is a perfectly romantic place to wander hand-in-hand. Do as the locals have done for centuries and enter the city over the bridge – recently remodelled by London’s Shard architect Renzo Piano – and pass through the original bastion walls. Meander through the narrow streets, stop in impressive gardens – including the Upper Barrakka Gardens with its huge arcades and panoramic views – and generally get lost in another time surrounded by all the historical sites. Romantic lighting transforms the city in the evening too, giving it an even more intimate feeling, sparking yet more romance for honeymooning couples. Experience another side of life in Valletta by visiting the palazzo of a noble family, such as Casa Rocca Piccola. This palazzo is also home to an intimate restaurant serving traditional Sicilian cuisine. Valletta is this year’s European Capital of Culture, bringing yet more cultural excitement to an already culture-rich environment. Malta is also home to a wealth of subterranean archaeological sites that give added insights into the island’s fascinating history, hence the UNESCO World Heritage status. The Hypogeum is a network of underground chambers thought to be a prehistoric burial site and a temple. 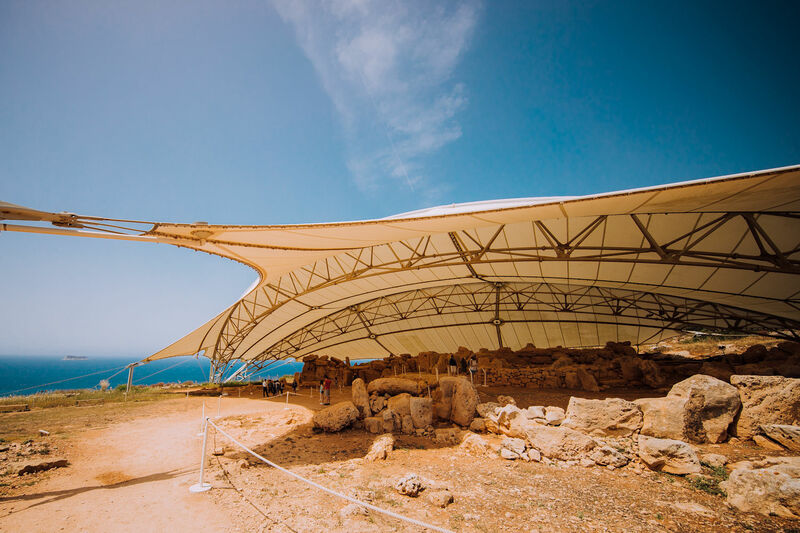 The Megalithic Temples are thought to be the oldest free-standing structures on Earth and are home to fascinating artefacts dating back thousands of years. Many sites such as these only allow restricted numbers of visitors in order to preserve them, but this also helps visitors gain more personal experiences of these one-of-a-kind locations. 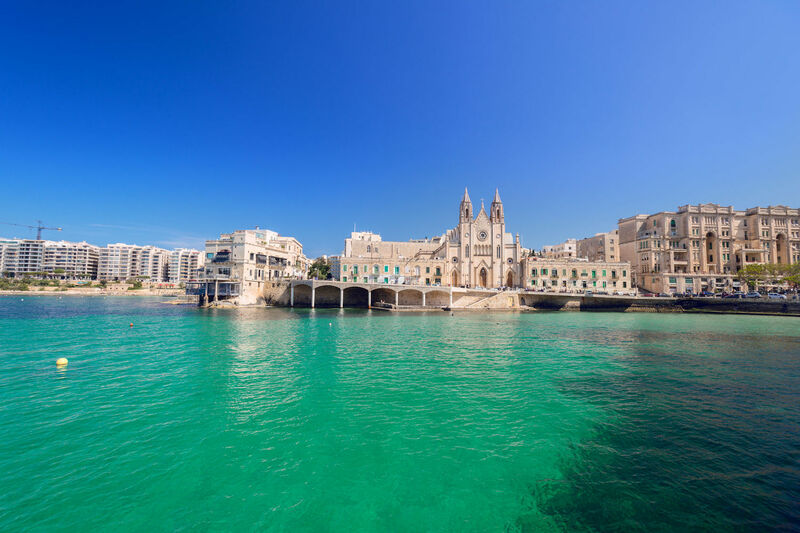 The Grand Harbour is Malta’s natural harbour, which stretches more than two miles inland with various wharves and docks creating an enormous amount of sea frontage. This is a place to wander along while enjoying incredible, far-reaching views, soak up the harbour’s immense history and embark on a boat ride to experience the full splendour of the locality. Charter a small water taxi (dgħajsa) for a more romantic tour of The Three Cities – the harbour’s most ancient settlements – or book a romantic evening sunset boat journey with bubbly and food for an extra special honeymoon treat. There are a variety of waterfront restaurants and bars back on solid ground, ideal for enchanting evenings where love is most definitely in the air. An inland walled city worth visiting is Mdina, complete with extraordinary palaces, impressive architecture and narrow streets ripe for getting-off-the-beaten track. For couples who like vibrant surroundings and nightlife, the seaside town of St Paul’s Bay is just the ticket. With restaurants, beach clubs and wine bars, there’s a little something for everyone. Sliema is well-known for its long waterfront promenade, while St Julian’s to the north has an entrancing 17th century watchtower and plenty of amazing restaurants. Both localities are ideal for long walks in pristine surroundings and a selection of restaurants, bars and cafés along the promenade. It’s really easy to reach Malta’s neighbouring islands of Gozo and Comino by boat too. Go on day trips and tours to experience rugged landscapes, panoramic views, meals in local villages and gentle hikes. These islands certainly bring an added feeling of romance and discovery. The clear waters full of shipwrecks and cave systems make Malta a popular scuba diving destination. For active couples, it’s an exciting activity to embark on when honeymooning, and there are dives available for everyone from beginners to experienced divers. 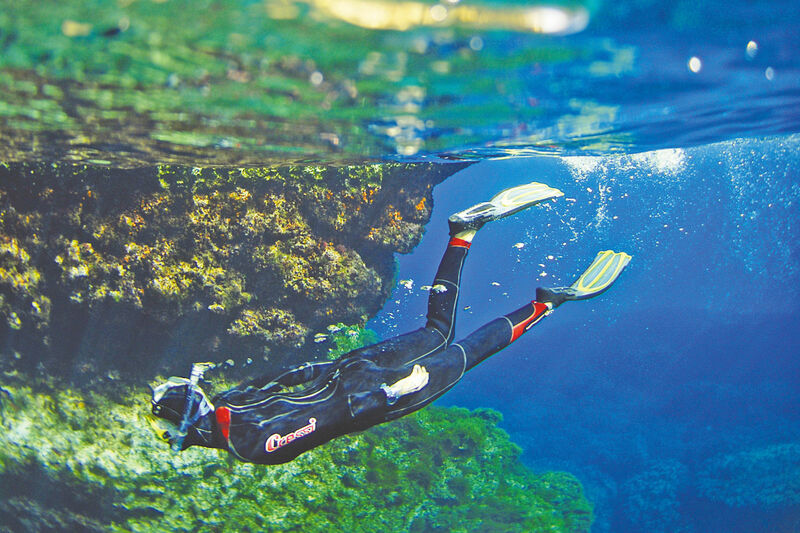 Dive sites can be reached from the shore or on short boat journeys. Plenty of dive providers also offer day trips to the neighbouring islands of Gozo and Comino for even more diving opportunities. Plenty of instructors will bring underwater cameras with them too – ideal for capturing perfect honeymoon snapshots of happy newlyweds. For couples who love beach time, Malta and its surrounding islands have no shortage of options. The Blue Lagoon in Comino is one of the most popular due to its turquoise waters and opportunities for swimming in calm waters. Paradise Bay in the north of Malta is another evocatively named beach, fairly secluded with gorgeous views, with paddle boats and canoes available for romantic boating excursions. For beach adventures that take you a little further off the beaten track, Ghajn Tuffieha is an interesting option, as it’s managed by the Gaia Foundation, an environmental NGO. With green credentials and seclusion, but sunbed and some water sport facilities, this is a beach for romantic adventurers. St Peter’s Pool is another unusual spot – it’s a gorgeous natural swimming pool popular with locals. 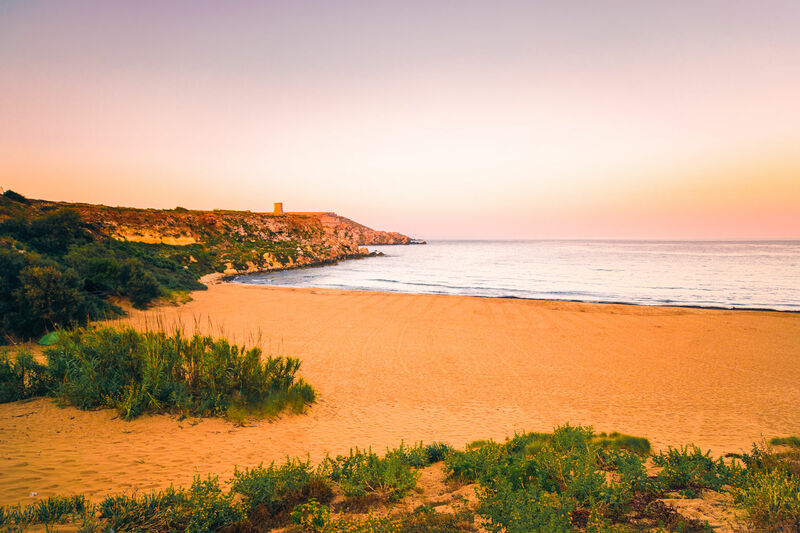 Additionaly, Ramla Bay on Gozo is a beautiful red sand beach worth exploring. Many of Malta’s beaches offer activities including windsurfing, jet skiing, sea kayaking, water skiing, wakeboarding, paragliding and more. 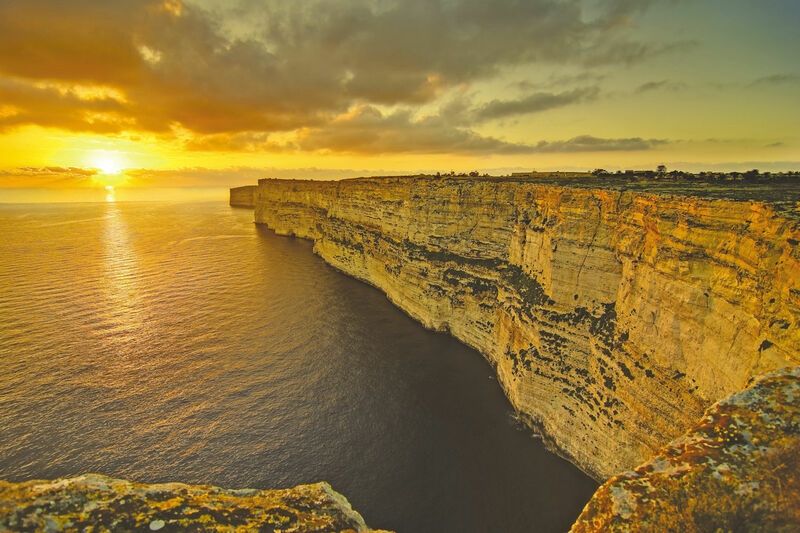 For a romantic excursion, head over to the Dingli cliffs – marking the highest point of Malta. With breath-taking views and a top-of-the-world feeling, this is a must for soaking up sunset on a honeymoon. Honeymooning couples have some extra special hotel options in Malta offering intimate nooks and crannies, stunning views and facilities offering opportunities for ultimate relaxation. 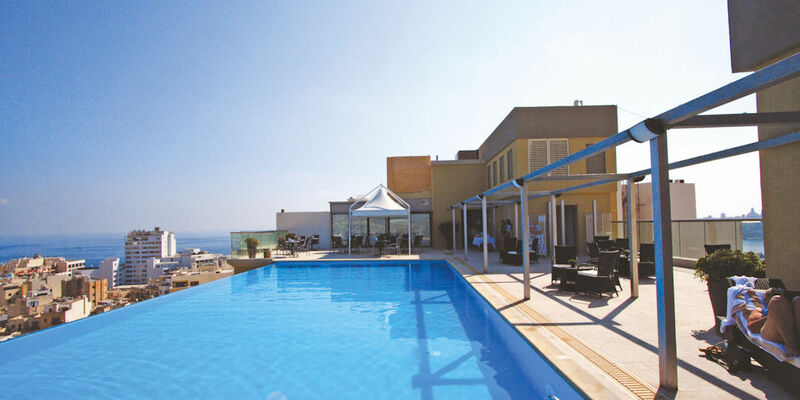 The Palace in Sliema is one such option, with original designer suites and 360 degree views from the pool and deck at the five star hotel’s upper levels. The three-storey spa and wellbeing centre is ideal for couple’s massages and general chill-out time, while a choice of bars and an Asian rooftop restaurant complete the picture of a captivating honeymoon. 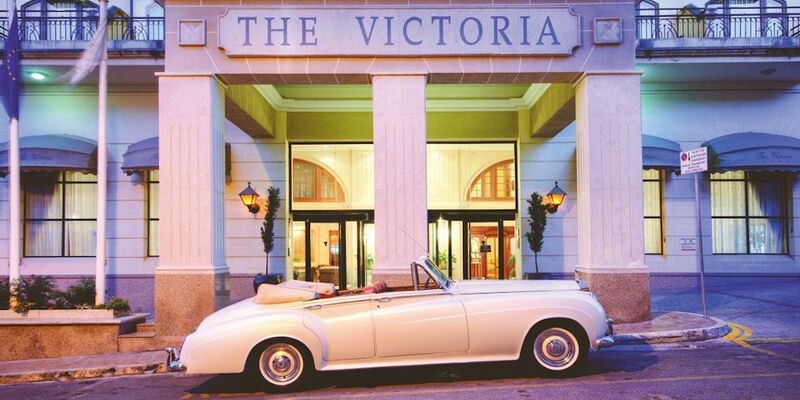 In Sliema, The Victoria Hotel high-end suites create a spacious home-from-home, while a rooftop pool offers bewitching views over the town and the sea. The spa is an ideal place to retreat to for some quiet time together, while a choice of bars and restaurants paves the way for evenings of intimate dining. Couples who want to stay in the heart of Malta’s history should head to The Phoenicia Malta, one of the Leading Hotels of the World. With views of the Grand Harbour and over the rooftops of the ancient City of Valletta, this is a spellbinding place to stay. 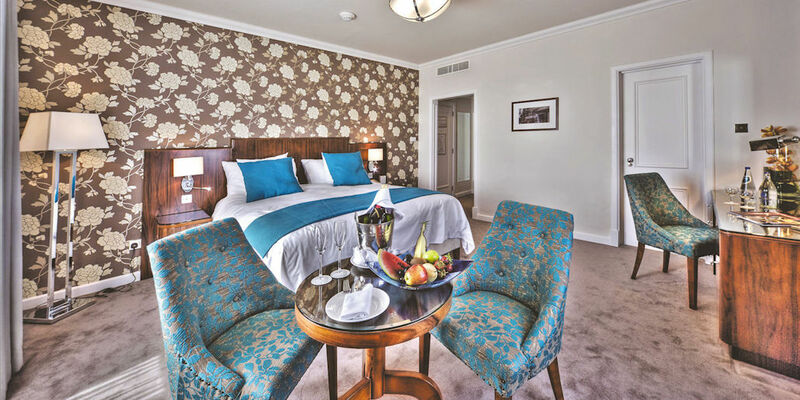 Lavish rooms and suites are full of life’s luxuries – the Valletta Suite is the perfect honeymoon suite, with three private balconies and an expansive living space. A handful of restaurants, bars and lounges provide plenty of options for cosying up in the evenings with delectable Mediterranean meals and vibrant drinks menus. 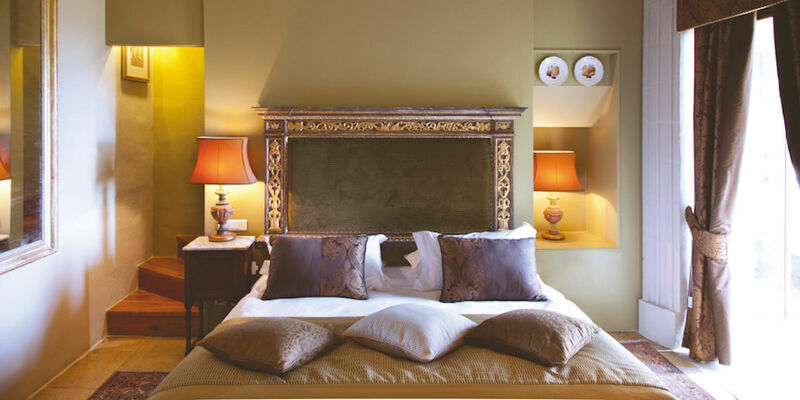 The Xara Palace Relais & Chateau in Mdina is another spot for discerning honeymooning couples. A boutique hotel with just 17 rooms, exclusivity is the name of the game here, particularly as the hotel is found inside a 17th century palace. Every suite offers a unique and inspiring view; some have private terraces and Jacuzzis too. A range of restaurants run by talented chefs mean every meal is a celebration here – just as it should be when honeymooning in Malta.